I got a PS3. Hoorey! A very good piece of harware, that gets better with every update of its system software, which is not excellent, if you ask me. Since I am the guy that wants to relax and I do not realy enjoy watching series, movies etc on my desktop, I prefer to do that on the TV. Ever since...well ever... I have been connecting the laptop on the tv and watch it from there. I got bored of doing that. I have to connect and disconnect all the same cables I have to get up from the couch to pause/play etc and it is just plain stupid. Ok, I thought I have got a behemoth of a machine sitting next to the TV that can play videos, music and so on. The problem with that is that PS3 cannot handle all kinds of video formats and has very limited storage(mine is 40 GB but there are 80GB versions as well). Only my TV rips are more than 100 GB and are on various formats. I had to find a way to stream video on the PS3. After a litle googling I settled for Tversity. Tversity is an excellent media server that streams video to all kinds of devices including PS3 and is completely free. Unfortunately there is only a Windows version. Setting it up is fairly simple. In order to get it working uninstall all codecs from Windows and install the latest version of ffdshow. Then install Tversity witout installing the build-in ffdshow. After that, it is just a matter of adding videos and music on its media library using Tversity interface. Make sure though from the settings to select to allways transcode the media before streaming. Provided that both the computer and the PS3 are on the same network grab a beer and sit back on the couch to enoy your videos. 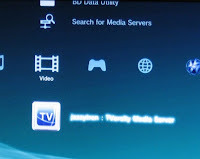 All of the media that you added on the Library can be found on the video and music sections of the PS3 interface. A slight discomfort was that since my girlfriend wants to have subtitles I tried, with no success at first, to get the subtitles to work. The subtitles are handled from the fdshow and I had set them to be transcoded as well. They did not show on screen though. After searching on the net I found that subtitles do not always work. In order to get them to work you have to start the media server manualy from command line with the debug flag on (>mediaserver -debug). Odd but anyway it worked.